Do you work in a noisy office environment? Stay focused with Jabra’s Skype headsets. Excellent sound quality and reduced background noise. Clearer calls. Fewer misunderstandings. Guaranteed. Are you using Skype for Business? Jabra headsets and speakerphones are certified for and work seamlessly with Skype for Business. No fuss. Connect straight away. When you’re looking for the right Skype headset, it's important to consider how and where you are working. Do you need something small and discreet to help you take calls while you're on the move, or are you more likely to work from one location where connecting to your phone or PC would prove highly beneficial? 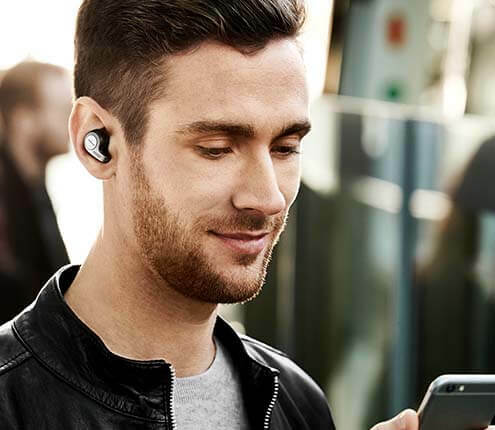 As every Jabra headset designed to work with Skype for Business, the perfect fit will depend completely on your circumstances. Work primarily from your desk? Your chosen Skype headset should cancel out the noise of others around you, connect seamlessly with other devices and let others know when you're busy taking a call. Travel a lot, but need to accessible 24/7? 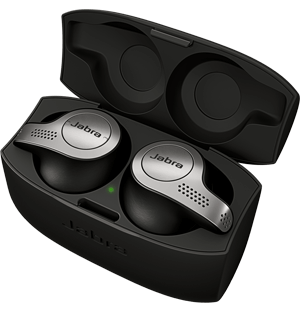 Pick up Skype headphones from Jabra that enjoy a long battery life, offer a large wireless range and feel lightweight for all-day use. Discover your perfect Skype headset below. The Evolve 80 has superior Active Noise Cancellation and Passive Noise Cancellation in an over-the-ear wearing style. An integrated busylight shields you from interruptions and enhances your productivity. A wired professional headset that delivers outstanding sound on both ends of the call. 40% lighter than competing headsets, with super-soft leatherette headband and ear cushions. Built to last with a reinforced cord and unbreakable boom arm.